Vancouver, June 11, 2018 – Wolf Wiese CEO of Golden Dawn Minerals Inc., (TSX-V: GOM; FRANKFURT: 3G8B; OTC: GDMRF) (the “Company” or “Golden Dawn”) provides assay results from sampling conducted in the Lexington Mine and an update on activities completed. The Company is aiming at initiating trial mining and processing before year end. Rock chip sampling is being conducted in the mine to assess the working faces remaining from the 2008 mining campaign that are currently accessible. A total of 339 individual samples have been collected so far. Results from the first batch of 206 samples sent for assay are provided below. The sample results are very positive and demonstrate that potentially economic grades of copper-gold mineralization are exposed on the faces in the mine. The results also serve to substantiate and provide confidence in the mineral resource as reported in the 2017 PEA report. The methodical mapping and sampling will provide the technical team to develop a mining plan based on the data gleaned from this work. The results will be used as a guide to minimize dilution of the mill feed from day one of trial mining. 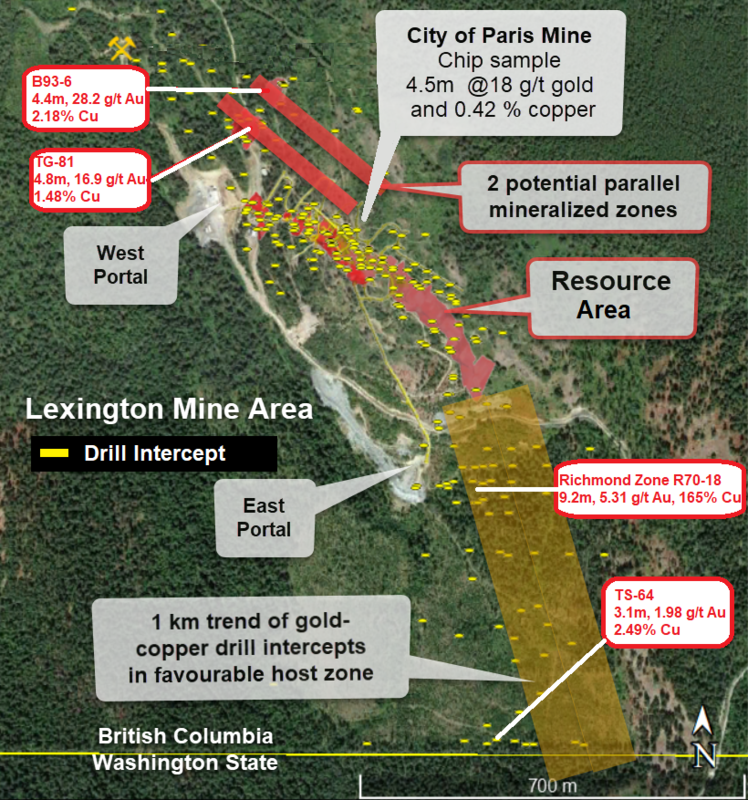 Compilation of exploration data around the Lexington mine has highlighted areas with high potential for discovery of similar style gold-copper mineralization. Potential for at least two parallel zones of mineralization close to the Lexington Main zone are documented in the PEA, and potential has now been recognized for strike extension of these potential zones to the northwest at least as much as the known extent of the mine. 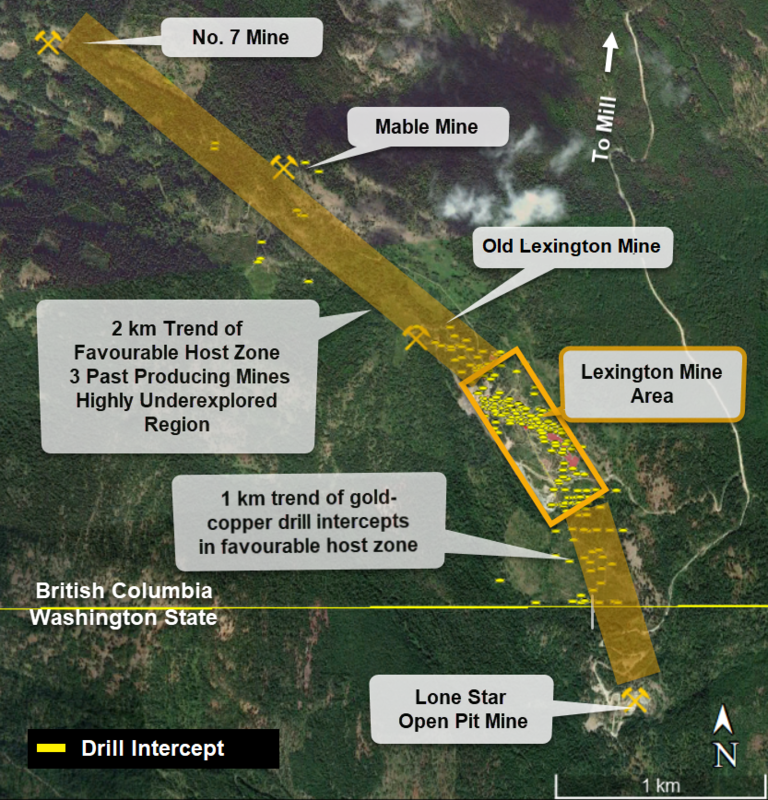 There is a 1 kilometer long trend of favourable host rocks that stretches from the Lexington mine across the border with Washington State and into the former Lone Star open pit mine, within which several historic drill intercepts of significant copper-gold mineralization occur. The favourable stratigraphy also extends over 3 kilometers to the northwest through the historic Lexington, Mable and Number 7 mines, where minimal past exploration drilling was done. Good potential for mineralization over significant widths also exists in the vicinity of the City of Paris historic mine that overlies the Lexington Main zone, as indicated by a chip sample collected in 2017 at a raise break-through from this mine. This sample was previously reported in news release dated 30 January 2018 but check assaying for gold returned a result of 18.0 grams per tonne gold over a sample width of 4.5 meters; the original copper result was 0.42%. The Company is ready to begin installation of mine infrastructure. However, prior to this various updates to permit documents are required by the Ministry of Mines for the mine and mill. These include Environmental Management Systems, Water Quality Monitoring Plans, Waste Management Plans, Waste Rock and Tailings Management Plans, Erosion and Sediment Control Plan, Mine Plan, Ground Control Management Plan, Waste Dump Operation and Surveillance Manual, Invasive Plant Management Plans, Closure Management Manual, and Life of Mine Reclamation Programs. The samples reported above were collected under the supervision of Dr. Mathew Ball, P.Geo. and delivered to Activation Laboratories (Act-Labs) in Kamloops, B.C. Activation Laboratories (Act-Labs) is an independent commercial laboratory that is ISO 9001 certified and ISO 17025 accredited. Analyses for gold were by the fire assay method using 30 gram samples with an AA finish. Fire assay gravimetric analyses were carried out on initial gold analytical results in excess of 30000 ppb gold. Other elements were analyzed by ICP-OES using an aqua regia digestion. Copper results above 0.75% were re-analyzed by peroxide fusion. Quality control was monitored using reference standard, blank and duplicate field samples inserted into the sample sequence at intervals. The Company would like to clarify that it has not based its decision to proceed to production on a feasibility study of mineral reserves demonstrating economic and technical viability. The Company cautions that, in such cases, there is increased uncertainty and higher economic and technical risks of failure.